It’s time for yet another big case show…case. If you’re looking for a protective accessory to keep your iPad safe, clean, and transportable, your faithful Macworld staff is on the…case. And we’ve got plenty of pictures besides, just in…case. Don’t let the bad puns mislead you—after covering so many cases over the past few weeks, I just had to get them out of my system. We’ve got gear for all tastes and ages, from tiny hands with destructive power to high-powered businesspeople who need their entire office on the go. It’s all in this week’s iPad case roundup. The Joy Factory: The Folio 360 II ($60; iPad 2) is a leather case that provides protection while offering stand positions for typing or for viewing in landscape or portrait orientation. 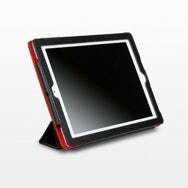 Its strategically positioned magnets put your iPad 2 to sleep when the case is closed. The SmartBlazer 2 ($60; iPad 2) is a leather folio that looks a cross between a Smart Cover and the interior of a classy sports car. Black with red stitching, the SmartBlazer works very much like Apple’s own case, down to the panelled front and magnetic closure. If you don’t feel like adding bulk to your device, The Joy Factory also offers the Smart Fit ($30; iPad 2), a thin, snap-on, rigid case made of transparent polycarbonate. According to the company, the case is less than a millimeter thick and is compatible with the Smart Cover. KEM's Big Grips are designed to protect against the most destructive forces of nature: small children. The company’s iPad 2 lineup is completed by the Prism 2, a glossy screen protector that comes in a pack of two for $25. KEM Ventures: Children are lively, have big hearts, and possess the seemingly innate ability to destroy anything within a six-block radius of their fingers. That may sound like the premise of a Dennis the Menace movie, but it's also the reason for the Big Grips iPad accessories. The thick, protective Big Grips Frame and Stand have been designed with small hands in mind—available in blue, green, pink, or grey, these foam accessories are non-toxic lead- and latex-free, and resistant to all sorts of staining agents. The Frame alone will set you back $35, while the Frame/Stand combo costs $50. MusicSkins specializes in entertainment-related motifs. MusicSkins: The company, which specializes in vinyl skins with showbiz- and music-inspired themes, has just announced the availability of iPad 2-compatible designs. Each will set you back $20. Ozaki: The iCoat Versatile (pricing information unavailable; iPad 2) has so many functions that it reminds me of those old infomercials—“It peels! It slices! It chops!” This case, however, is no cheap late-night TV offering—in addition to acting as a stand capable of multiple display angles, the case ships with a shoulder strap, a car headrest wrap, a hand pocket, and a wrist strap. And did I mention the capacitive stylus? The iCoat Versatile from Ozaki ships with an abundance of accessories. The wraparound iCoat Notebook (price unavailable; iPad 2) doesn’t come with quite as many accessories—just the capacitive stylus—but it still doubles as a reading stand and a typing platform. Speck: Lovers of skiing rejoice! Revered snowboard-gear vendor Burton has joined forces with Speck to produce a series of Burton Fitted Cases for iPad. Inspired by a number of funky styles from Burton's apparel collection, the cases feature Speck’s form-fit, two-piece case design for reliability and sturdiness. The line includes three styles—Buffalo Plaid, Headache Dot, and Lumber Lighter—for $60 each. STM: From Down Under comes the Org Board (price unavailable; iPad & iPad 2), a nifty, form-fitting neoprene sleeve that features a number of convenient straps on the back for securing cables, headsets, and even a phone. STM has also announced the Skinny, a wraparound case made of water-resistant polyester with a micro-suede interior lining. The Skinny features a magnetic closure and doubles as both a viewing stand and a typing platform. Available in black, mushroom, sage, or berry, the case is slated to launch in early April with a projected price of $40. 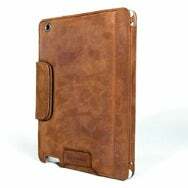 Temple: The Smart Case ($179, iPad 2) is manufactured out of repurposed World War II-era canvas and oiled saddle leather, which provide excellent durability and protection. The case also features a convenient magnetic closure that doubles as a typing aid, and it can also be propped up to act as a landscape-orientation stand. The Smart Case is also available in an all-leather model, which offers the same features for $199. The company is planning to introduce these two cases on March 25 and May 2, respectively. Temple's Smart Case in leather. Tunewear: Throwing its full weight behind the iPad 2, Tunewear has announced a treasure trove of accessories. On the simple side, the Tunefilm ($15) is a protective film that covers the front of the iPad 2 and is available in both clear and anti-glare versions. The Eggshell (price unavailable) is a lightweight case made of transparent or smoke-tinted polycarbonate that protects from unwanted dust and scratches while adding less than one millimeter of thickness to your iPad. The case ships with a Tunefilm and a cleaning cloth. For thin protection with a little more color, you can instead opt for the Softshell (price unavailable), which comes in smoke, pink, or blue. In the folio category, Tunewear is gearing up to offer two stylish accessories: the Tunefolio (price unavailable), a synthetic-leather case that can be propped up at various angles for reading or typing, and the Tunefolio Urban (price unavailable), which includes a handy pocket for things like a phone or pens and paper. Interestingly, both cases also include a handy carrying strap. USBFever: The Kilt/Check Pattern Pouch/Bag ($17; iPad & iPad 2) is a handy, lightweight pouch with an elastic closure, carrying handle, and shoulder strap. One challenge, however, may be telling it apart from the tablecloth at a restaurant in Little Italy. Waterfield: Why settle for a case when you can have an “all-in-one mobile office solution” at your fingertips? Waterfield’s iPad Travel Express ($69; iPad & iPad 2) has enough compartments and pockets to hold your iPad (in the case of the iPad 2, with or without a Smart Case), keyboard, cables, charger, and phone. The padded Express comes in black ballistic nylon with green, red, brown, teal, grey, or black accents.